Lorraine Estelle began her career in the publishing industry before moving to Jisc in 2002. There she became CEO of Jisc Collections, the UK's academic library consortium. There she also conceived and led a number of research projects including the National e-books observatory project. She successfully won funding to develop a number of shared national services for UK academic sector including the Journals Usage Statistics Portal and Jisc Historic Text. She joined COUNTER as Director in the summer of this year, where she is focused on improving the utility of the COUNTER Code of Practice. Lorraine is also co-editor of Insights: the UKSG journal. Welcome to our summer issue of Insights, where we are debating some of the hot topics in our fast-changing world. Rick Anderson brings us a thoughtful and well-timed article on fake news and alternative facts. He argues that in light of recent worldwide political developments, the library’s role, more than ever, is to defend the truth and to help library patrons discriminate between reality and lies. However, this not as simple as it sounds. As Rick says, ‘… pure truth may indeed be out there, but no one can be relied upon as an authoritative witness of it’. Other articles in this issue also reflect change; Steven Inchcoombe discusses the transforming role of research publishing and provides Springer Nature as a case study. Jean Roberts provides a fascinating article about how innovative technologies have the potential to open new revenue for research funding in the UK. As higher education institutions seek to compete for students globally, provision of library resources to students in overseas campuses is increasingly important, but a minefield of licensing complexity. Ben Taplin and Carolyn Alderson explain how Jisc Collections is seeking to address the issue through its model licence and decision tools, and Anna Franca from King’s College London and Ruth Dale from University of Nottingham provide case studies. Some of you may have read Stuart Lawson’s article about Sci-Hub in the last issue of Insights. In this issue, Tasha Mellins-Cohen argues that we need to find a balance between our desire for security and lowering barriers to access. She points out that we can make use of technologies and initiatives which are already in place to help us to strike that balance, encouraging users to access versions of record instead of resorting to less legitimate copies through services such as Sci-Hub. The rise of the concept of ‘library as publisher’ has caused many university libraries to consider their role in the world of open access (OA) publishing. Cath Dishman explains how Liverpool John Moores University (LJMU) Library Services has taken its first steps into that world by the offering of an open journals hosting service. The evolution of e-books is a familiar theme in Insights and no wonder, as libraries spend a growing proportion of their increasingly stretched budgets on e-books each year. Angela Conyers, Jo Lambert, Laura Wong, Hilary Jones, Marianne Bamkin and Pete Dalton have done some research for JUSP (Journal Usage Statistics Portal) into the provision of COUNTER usage data, so important for libraries in evaluating user behaviour and value for money. They outline the challenges faced by those dealing with e-book usage statistics and make common-sense recommendations for change. Tony Davies describes the evolution of an e-book demand-driven acquisition programme at Swinburne University of Technology. He has found that the new Access-to-Own (ATO) model has allowed an expansion in numbers of e-books available to library users and that early analysis indicates that this will be a sustainable and cost-effective method of acquiring e-books. Victoria Dobson and Alistair McNaught point out that for students with print impairments, e-books offer great potential for removing barriers to information. However, for various reasons, not all e-books are fully accessible. They organized a crowdsourced e-book accessibility audit, which now provides a framework for librarians and e-book providers to effect improvements. Another perennial issue is that of the discovery experience. Rachel Kessler, Lettie Conrad, Kathleen Donovan, Bruce Heterick and Alexa Pearce point out that librarians and content providers struggle with the ambiguities in discovery tools. They have collaborated to propose ways in which we can overcome some of these challenges through analysis and dialogue. Elaine Sykes tells us about a new approach to using quantitative data being trialled at LJMU Library Services. By employing business intelligence software to interrogate, combine and analyse a variety of data sources, data is transformed to provide insight into customer needs and preferences, which will better inform the library’s services. With forecasts pointing to an increase in outsourcing, Lorraine Ellery asks what services in scholarly publishing will be fully or partially outsourced by 2020, and discusses how risks can be mitigated and how outsourcing can be most effectively managed. To whet the appetite of those of our readers who have never attended a UKSG Conference and Exhibition, we bring you the summary of six students and early career professionals who were sponsored to attend the conference this year. ‘UKSG is to conferences what Glastonbury is to festivals!’ one of them told us. They share with us their conference highlights, while we provide some interesting photographs of the evening entertainments. 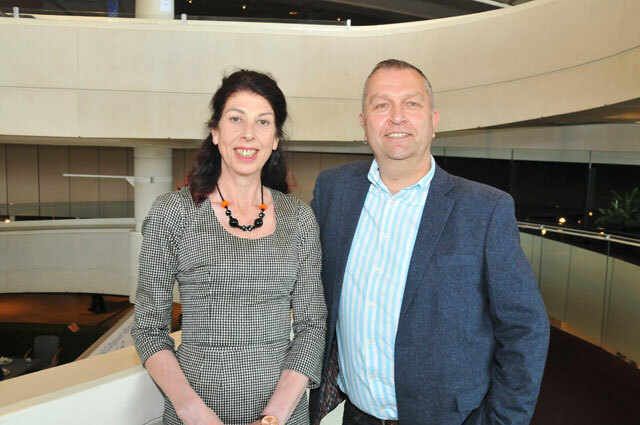 As well as attending the UKSG Conference and Exhibition, another privilege for us editors is interviewing ‘People in the News’. In this issue, we feature Sarah Wickham. She led the Heritage Quay project, which was winner in the ‘Buildings That Inspire’ category of the 2016 Guardian University Awards and was also the winner this year in the ‘under 2,000 square metres’ category of the SCONUL Library Design Awards. The project has not only produced a wonderful space, but also transformed the way Sarah and her team provide archive services – not just the range of what they do, but the way they think about collections and work with partners. We have two new initiatives in our Start-up story section of this issue. Jean Roberts tells us about Glasstree Academic Publishing, which aims to shake up the academic publishing industry by firmly establishing a whole new category of publishing. Ruggero Gramatica and Ruth Pickering tell us about Yewno, whose name comes from a play on words: ‘You know’. It also refers to the English yew tree and its mystical significance as a tree symbolizing transformation and rebirth. The company has designed an AI-driven discovery environment to assist librarians in helping researchers to more effectively and meaningfully navigate an ocean of data. We hope that, as well as reading this issue of Insights, you will be inspired to submit an article (http://insights.uksg.org/about/submissions/). We very much welcome your articles on research projects, your case studies and your opinions that will encourage the exchange of ideas on scholarly communication.